Over the weekend Boeing announced the completion of its first 787-9 Dreamliner, which is slated to be delivered to Air New Zealand in 2014. The 787-9 line is 20 feet longer than its predecessor the 787-8, which allows the 787-9 to hold 40 more passengers. 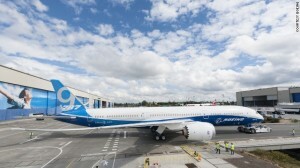 As with all of Boeings newer planes, the 787-9 has been designed to use 20 percent less fuel then other planes its size.